Last fall we headed south to Costa Rica, to experience our first taste of Central America (outside of Mexico, after falling in love with what we saw of South America. The Latin American culture sets the stage for a family-friendly vacation full of natural landscapes, delicious food, friendly people, and a plethora of Costa Rica wildlife to see. During our stay in Costa Rica, we learned a lot about the country, and had the opportunity to tour around and experience a variety of places. Everywhere we went, life was abundant. You could barely move 5 feet without catching a glimpse of a colourful bird or stepping on a creeping creature. Over our 2-week stay in Costa Rica, here are some of the wildlife that we encountered first-hand. If you’re planning a trip to the land of Pura Vida, keep your eyes open for these. While I may make some small notes on some of these creatures, I aim to merely show you the options for wildlife spotting while in Costa Rica, rather than an in-depth look. Please feel free to comment below with any additional questions about any of these creatures. These guys were too cool! We saw them first right in the backyard of our rental in La Fortuna, munching these palm berries. We also got to catch some more views of them while staying in Villas Mymosa in Manual Antonio. Known as “lapas” to the locals, these birds are stunningly beautiful. We saw many flying free all over the place, but the best spots were in the village by Playa Tarcoles, and when we stayed at Villas Mymosa. These were all over in Manuel Antonio park. They also invaded Villas Mymosas several times during our stay, eating bananas from the bar and climbing all over the trees, roofs, and balconies there. Leaving a toddler on her own with a bag of snacks while the monkeys were around was a scary prospect. They are so brave! We saw one sleeping up in the trees when we went on a guided tour of Manuel Antonio Park. These somewhat bigger monkeys came through Villas Mymosas, and were seen in Manuel Antonio Park, as well. I so wish I got a good video of how these ants move about. Instead, I’m embedding a video from YouTube (not mine). The leaf-cutter ants carry pieces of leaves they’ve sawed off of trees through their mowed down paths to their underground nests to cultivate a mushroom. You can read more about these guys in this previous post: 9 Things To Know About Costa Rica Before You Go. We saw more frogs that we snapped on the camera. One in particular was huge and amazing to find on a late-night walk through a seemingly deserted part of Villas Lapas near Tarcoles (which I’d totally recommend you stay at if you’re in the area). That was an intense walk, with so much moving around in the dark that we couldn’t place, scaring the crap out of us multiple times. An adventure I’ll never forget! We were surprised to see raccoons on our riverboat crocodile tour along the Rio Tarcoles. I didn’t realize raccoons had such a far range! We were even more surprised when one casual crossed the path a mere few feet in front of us, as we made our way back up from Playa Biesanz in Manuel Antonio. We saw them again on the beautiful beach in Manuel Antonio Park. My husband got this neat shot (and the next two) on our tour along Rio Tarcoles. These ones above were probably the most unique birds I’ve ever seen. Seeing sloths was something I really wanted to do while we were in Costa Rica. Manuel Antonio Park did not dissapoint! Make sure you get a guide if you go looking, as we tried for a while without (we’re cheap), and ended up going back to get a guide that could show up so much more. Well worth the money. 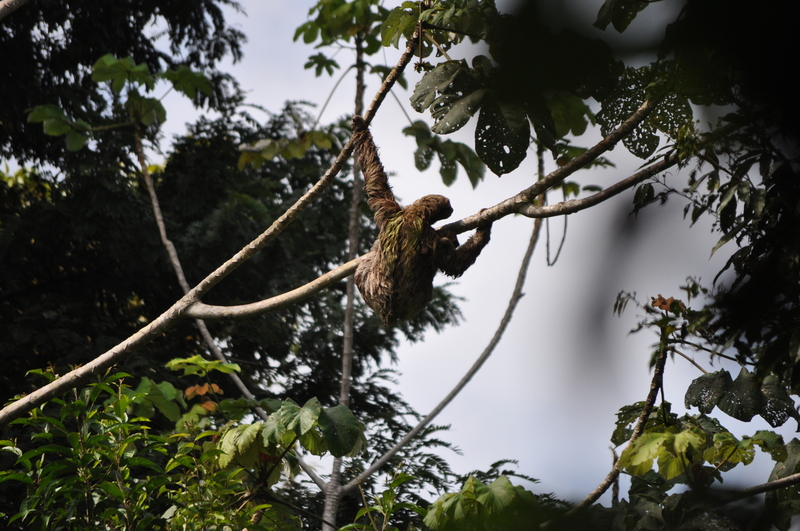 We even got to see a couple different mama sloths (all 2-toed sloths) with their babies nestled up on their bellies. These and the crocodiles tie for the coolest Costa Rica wildlife we saw. Driving by these guys at first surprised us. We had to back up to get a better look, wondering what they were. We found out our assumption was right – they are funny, friendly coatis! No pictures of these guys, but it was neat to see my first fireflies sparking around in the evenings at Villa Lapas. No pics of these creepy crawlies, either. On the Sky Tour near La Fortuna and the Arenal Volcano, the guide used her smartphone, with the flashlight on, to look into holes. In the banks along the trails, and the ends of the hand-rails on the bridges, we were shown that all kinds of little creatures hide, including some tarantulas and other spiders (like the poisonous banana spiders). We made sure to keep our hands clear of the handrail ends after that! So many geckos. Our 3-year-old was delighted. This guy was what we found when we tried the flashlight-iPhone-in-a-hole trick the guide at the Sky Walk showed us. Iguanas were everywhere. This is a black iguana. The Jesus Christ lizards were soooooo cool to watch! I first spied one at our breakfast buffet in Villa Lapas, which looked just like a dried up leaf. It took a while to realize this was actually a lizard. We watched it run around on it’s back legs, trying to sneakily scrounge up some crumbs from the restaurant floor. Too bad we didn’t have the big camera that morning, as we saw that guy and a few other really neat lizards then. 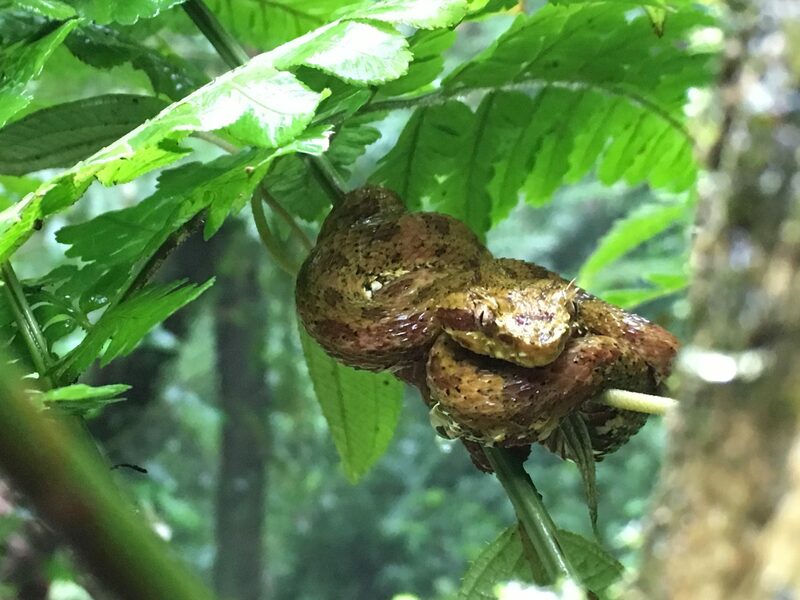 Very poisonous tiny snakes we saw on our Sky Trek tour near La Fortuna. They look just like little dog turds sitting on or beside the path. Easy to miss, so keep your eyes peeled! We saw a few different species of kingfishers on our tour on Rio Tarcoles, including a pygmy kingfisher, the smallest species (second picture). A couple different species were pointed out to us in Manuel Antonio park. These guys were just hanging out on the underside of a big leaf at the side of the trail when we entered the park. So many different species. The bright blue guys were incredible! 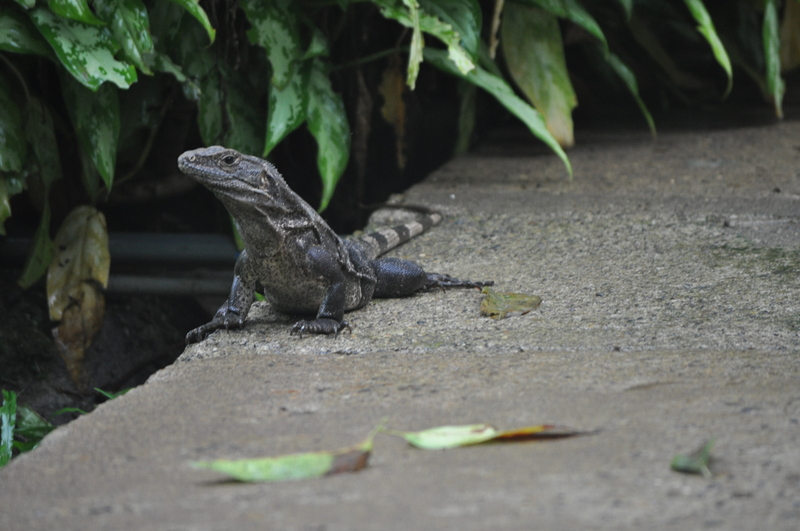 This one we saw in Manuel Antonio Park. My husband, his grandpa, father, and brother-in-law went on a fishing charter while we were staying in Manuel Antonio. It will go down forever in all of their best fishing memories, I’m sure. They caught a plethora of fish, and many different species. (I only have a picture of the Mahi Mahi and Sailfish here, though.) The amazing chef at Villas Mymosa cooked up a seafood feast from what was brought back for an incredible price. All the staff their was fantastic, but that chef was the bomb! Costa Rica was the perfect place to experience a wide variety of interesting and familiar wildlife as a family. I’m sure there’s lots of Costa Rica wildlife that we didn’t get to see on this trip, but what we did catch a glimpse of was incredible. Stay tuned for more on Costa Rica and our other travel adventures. You can sign up here to receive a short and sweet weekly email letting you know what’s new on The Big To Do List. I’d also love to connect with you on social media. You can find me on Facebook, Instagram, Twitter, and Pinterest.